Population mixture is an important process in biology. We present a suite of methods for learning about population mixtures, implemented in a software package called ADMIXTOOLS, that support formal tests for whether mixture occurred, and make it possible to infer proportions and dates of mixture. We also describe the development of a new single nucleotide polymorphism (SNP) array consisting of 629,433 sites with clearly documented ascertainment that was specifically designed for population genetic analyses, and that we genotyped in 934 individuals from 53 diverse populations. To illustrate the methods, we give a number of examples where they provide new insights about the history of human admixture. The most striking finding is a clear signal of admixture into northern Europe, with one ancestral population related to present day Basques and Sardinians, and the other related to present day populations of northeast Asia and the Americas. This likely reflects a history of admixture between Neolithic migrants and the indigenous Mesolithic population of Europe, consistent with recent analyses of ancient bones from Sweden and the sequencing of the genome of the Tyrolean ‘Iceman’. All European populations, to a varying degree, exhibit admixture from Karitiana but in Northern Europe the effect is stronger than in Southern Europe. The admixture also affected the populations of the Caucasus (Adygei). Some populations (Orcadian, Cyprus) evidently underwent genetic drift that caused the frequencies to drop (p. 83, Table 7). And the authors could have used any South or Central American Indian population to the same effect (p. 45). They did due diligence and collected Z scores on samples with 13 different ascertainments (Table 8) and 6 different outgroups (Table 9, which is incomplete without New World monkeys) but the results did not change. But Patterson et al. did not find any northern Eurasian population that would have a higher admixture potential related to French than Karitiana. They reported similar, but still lower values for Naukan Eskimos and Chukchi. 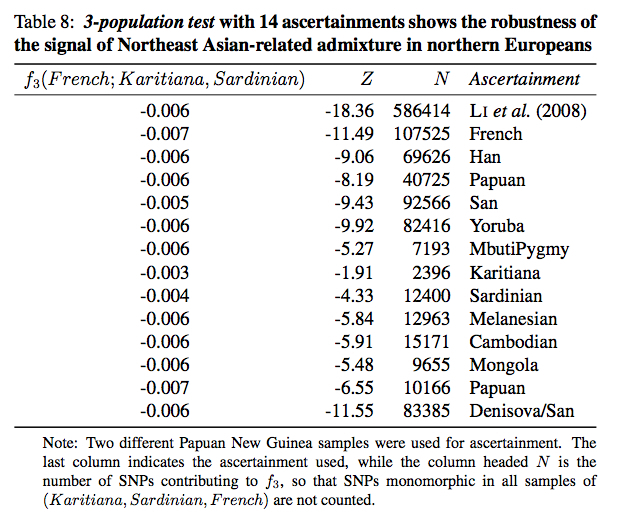 So, properly speaking, the authors discovered “Amerindian” admixture in Northern Europeans but because of fear of coming across as light-minded, they decided to call it “Northeast Asian.” Science has definitely lost its steam over the past centuries. Imagine if, upon seeing the evidence of the earth’s triple motion, Copernicus would not have proceeded to write Commentariolus but instead concluded: “I do not of course think that the Earth can possibly rotate around the Sun.” This kind of safe judgment on the part of the astronomer would have likely stalled the evolution of scientific thinking in Europe by a couple of centuries. Patterson et al.’s “shock” is also somewhat disingenuous because this “Amerindian admixture” was first reported 10 years ago by Rosenberg et al. (2002) (see below). Earlier this year Joseph K. Pickrell and Jonathan K. Pritchard. (“Inference of Population Splits and Mixtures from Genome-wide Allele Frequency Data,” 2012, 16) arrived at the same result using TreeMix (see below). 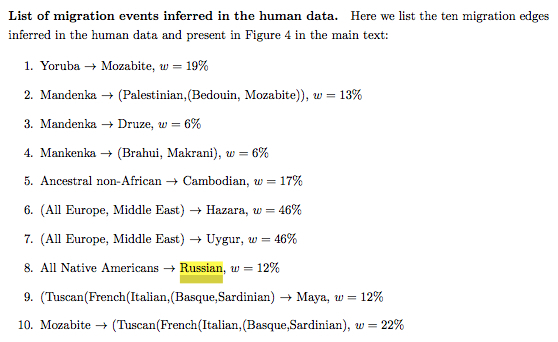 They summarized all the inferred migrations in the following list, with Russians being a proxy for Europeans receiving admixture from migrating American Indians. The “Amerindian admixture” in Europe is therefore not as new and shocking as Patterson et al. (2012) present it. But it may be getting traction across the genetic labs, so we may expect further elaborations, under different names, of the same finding. The priority is again given to an American Indian source over an Asian source and since C1 is unknown in the Eskimos of Greenland, it’s unlikely to have come to Iceland recently via a western route. The “admixture effect” described by Patterson et al. (2012) for the whole genome may, therefore, have an exact parallel in haploid genetics. What this means is that Karitiana-like autosomal admixture in Patterson et al. (2012) is the same as Reich’s autosomal “First American” component. This component is found in South, Central and North America, in the American Arctic and Subarctic populations as well as in Paleoasiatic populations on the Siberia side. Reich et al. agree that the presence of the First American component in Paleoasiatic populations represents a back-migration from the Americas. This explains well why the Chukchi and Naukan Z scores in Patterson et al. (2012) are lower than but close to the Karitiana scores. The European case should be no different. It’s also noteworthy that in both Europe and North America the “Amerindian,” or “First American” component is diluted by the “European” and “Asian” components. Around the Bering Strait, there are two separate Asian components found at increasing frequencies as one moves out of America. As I argued, it is illogical to postulate a founding migration to the Americas carrying the “First American” component, for which there is no evidence in Asia, followed by two more waves out of Asia, each one of which absorbing the “First American” component but then also passing it back to Paleoasiatic peoples. It’s much more parsimonious, especially in the light of Patterson et al. (2012), to envision a migration out of America bringing 1) the Amerindian component with deep roots in the southern areas of the New World to Asia and Europe and 2) Asian components with roots in the northern parts of North America. Finally, it may be instructive to compare the autosomal evidence for the Amerindian component in Europe with some good, old blood group distribution maps. 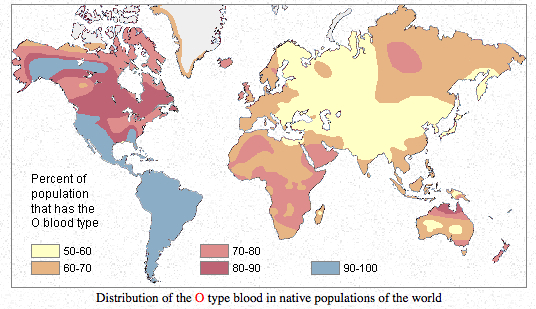 Blood group O is highly frequent in the Americas and reaches fixation in South American Indian populations. 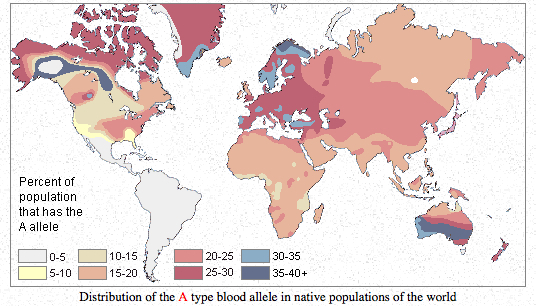 It can be compared to the “First American” autosomal component as well as to Y-DNA hgs Q and C. Blood group A has moderate-to-high frequencies in Europe and in northern North America, with Northern Europe being a standout in Europe (just like in the proportion of Amerindian admixture!) and with Algic-speaking (it means autosomal-First-American-component-carrying) Blackfoot Indians having the world highest frequencies of blood group A. 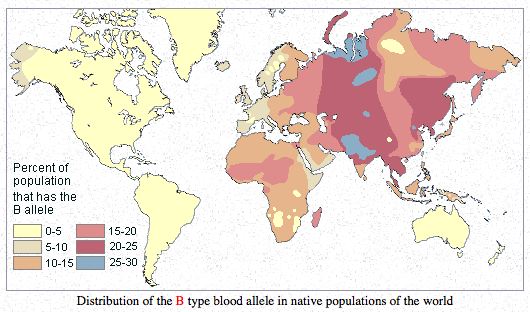 Blood group B is highly frequent in Asia but is absolutely absent in the Americas outside of the Eskimos. Whichever way one looks at it (from a late peopling of the Americas or from an out-of-America angle), hg B in Asia looks recent and endemic to Asia/Eskimos. Its distribution can be compared to Y-DNA hg O – highly frequent in Asia, absent in the Americas and in Australia. The usual interpretation of the blood group distribution maps is that American Indians progressively lost A and B as they descended to South America. This scenario is very forced as it does not explain world-highest frequencies of blood group A in Blackfeet and very low frequencies of blood group B in Eskimos and its complete absence among North American Amerindians. In the light of Patterson et al. (2012), Reich et al. 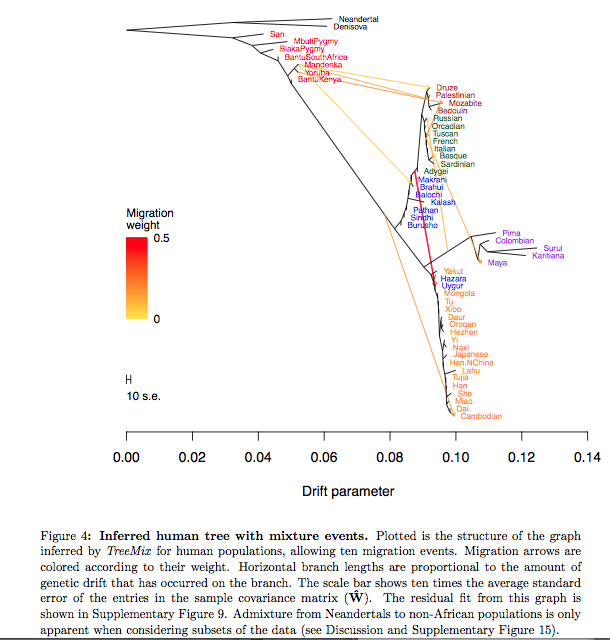 (2012), the mtDNA evidence for backflow from the Americas as well as the Denisova evidence for low intragroup allelic diversity in Mid-Pleistocene hominin isolates, it seems more likely that American Indians retain the originally high frequencies of blood group O, while blood groups A and B could be more recent mutations off of blood group O originating in northern North America and expanding from there to the Old World. It is highly symptomatic that the two Neandertals tested for blood group alleles showed blood group O (Lalueza-Fox et al. 2008. “Genetic Characterization of the ABO Blood Group in Neandertals,” BMC Evolutionary Biology 8: 342) confirming that the South American Indian blood group situation may be a Mid-Pleistocene hominin relic and not a recent dramatic departure from the current Siberian situation. In this context, it is important to clarify the relationship between Amerindian admixture in Europeans and Neandertal admixture in non-Africans. In modern populations, the latter is manifested stronger in Asia and the New World than in Europe and (arguably) Africa. And the Amerindian component is stronger in Amerindians than in Asians (see also here). It remains to be seen if pre-Neolithic Europeans were more Neandertal than contemporary Europeans. If they were this correspondingly may make them even more American Indian. I think that O blood group is not relevant for kinship of populations. O blood high rate shows only isolation or genetic drift (or founder effect). I always suspected that these groups were related. And I know they will want to bury it under the rug and replace Amerindian with Northeast Asian due to historical occurances. I am 23% Native American. My blood type is A+; my mother’s is O Negative. My daughter’s is O+. This is all interesting; however, there was a Native American Slave trade that started in 1492 that took various Native Americans to Europe and Africa. The NA component could be a result of that. It seems that most geneticists, historians, anthropologists, etc want to overlook the impact of world-wide slavery regarding genetic make-up of the world’s populations. This information only confirms the destination and intermarriage of the two populations. There is also evidence that Native American tribes such as the Iroquois and the Cherokee had R1B markers that match with populations from France (Silesia? ), Basques and Southern Europeans. How is it not possible that there was not an Frozen oceanic plate for American populations to reach Europe during the Ice age or use as launching pads for boats? I have seen pictures of frozen oceanic plates in the Atlantic on Ice age maps, how can it not be possible that the Sami/Greenland populations be related to a movement from North America across the Atlantic? An interesting thing is that every single modern human, regardless of tribal group or race has a innate genetic repugnance and repulsion towards Serpentes families (snakes) and Spiders (Arachnids)? This programmed fear of specific and unique order of animal species is too recent and coincidental to be discarded as irrelevant. The only scientific conclusion is that this familiarity with these specific species of animals coincided with the evolution of anatomically modern humans; therefore the origin of humans had to be in a continent where there was a high divergence and abundance of combative predatory serpents and arachnids in the opening episode of sapien evolution for such a recent genetic memory to encoded into the collective memories of human tribes. Which continent would fall into these criterion’s to effectively imprint a recent genetic memory onto sapiens and which continent was warm enough during the Pleistocene to house a large array and diversity of serpentes and arachnid families to imbibe such a memory onto sapiens in evolutionary terms, in which this diversity of predatory serpents and arachnids last to this day? The American or the South American continent of course. What was the diversity of species in South America during the late Pliestoscene and the environment/terrain there? Early Sapiens would in such a scenario, have evolved in South America and then traveled across a Central American corridor where they followed elephantae species such as gomphotheres onto North America and met Bison Latifrons, stag-moose, Castoroides, future Woolly mammoths, Woolly Rhinoceras etc. How is it by coincidence that there are European and North America Mooses, Eurasian and North American beaver populations, Elephantae reported in China and Rhinoceras populations in places such as Indonesia, South East Asia and Africa? These species had to have been descended from animals migrating across ice plates and ice free corridors towards different environments, and human movements and activity had to have influenced the backwards migrations of such animals from the America’s onto Europe. These creatures had to have evolved and originated in North America to walk and spread out onto the old world which coincides and further adds support of a human migration from the America’s to the old world.